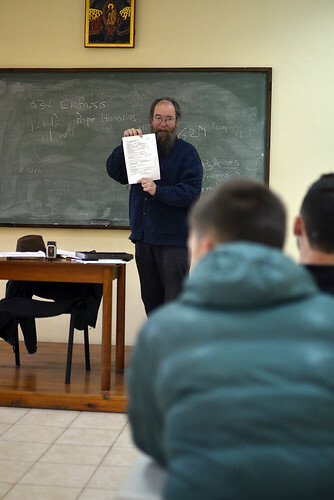 The Macdonald Family continues their ministry to help the seminary in Albania grow. Please keep them in your prayers, and offer your support, as the train future Church leaders and clergy. In August we finished a very full year of teaching at the Resurrection of Christ Seminary in Durres. Jeffrey taught four courses in Patristics and Church History this year, allowing him to work with all of the enrolled students. Caryn assisted the English classes and participated in the seminary’s music classes and choir. This coming year, the Resurrection of Christ Seminary will begin to offer an accredited degree by being integrated into the Church’s “Logos University College” as a Department of Theology. The change will allow students to pursue further studies after completing the seminary, and it will allow the seminary itself to have the possibility to offer graduate programs for the further preparation of future clergy and church workers. During this transition year, the fourth-year class will follow the old seminary program, while the first-year class will begin the new three-year university program. We will be faced with some changes, as accredited higher education is extensively regulated by the government, whereas the previous program was run independently by the Church. His Beatitude Archbishop Anastasios has asked Jeffrey to be the chairman of the theology department/seminary, and so he will be involved with these issues as well as continuing to teach. Jeffrey is teaching Early Church History and Old Testament this fall. We are very grateful for the continued support of the parishes and individuals that make it possible for us to teach at the seminary. Donations and monthly support for our work can be made through OCMC, designated to the Macdonald family, at ocmc.org. Please pray for the school as it transitions and for us as we work to prepare students for service in the Church.